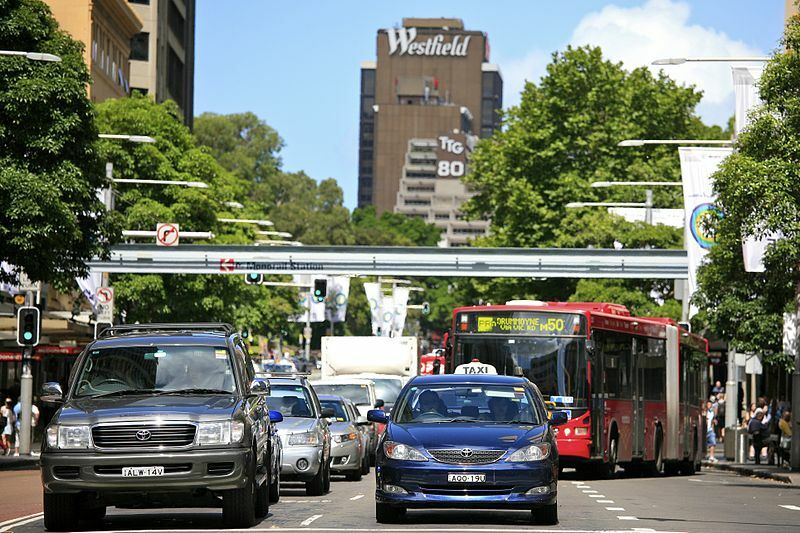 "Sydney City Traffic" by Alex Proimos via Wikimedia Commons is licensed under the Creative Commons Attribution 2.0 Generic license. These findings are described in the article entitled Ridesourcing, the sharing economy, and the future of cities, recently published in the journal Cities (Cities 76 (2018) 96-104). This work was conducted by Scarlett T. Jin and Hui Kong from The Ohio State University, Rachel Wu from Yale University, and Daniel Z. Sui from The Ohio State University and the National Science Foundation. Ridesourcing and the sharing economy have become the buzz word in recent years, but their impacts have been contested. This article provides a comprehensive review of the existing studies that investigate the impacts of ridesourcing on urban efficiency, equity, and sustainability. In popular media, transportation services like Uber and Lyft are often referred to as “ride-sharing,” which is quite misleading. Ride-sharing means the driver and passenger(s) have similar destination or route so that they share the ride and possibly also share the cost. What Uber, Lyft, and other transportation network companies (TNCs) do is to connect drivers with passengers via their apps. The drivers themselves don’t need to go anywhere – they drive for earnings, just like taxi drivers. Therefore, the services provided by TNCs are “ridesourcing” – sourcing rides through apps, not “ride-sharing.” In addition to ridesourcing, Uber and Lyft also provide “ridesplitting” services, in which two groups of passengers share the same ride. Although this may seem trivial, clarifying these conceptual differences is very important for discussing the true nature of ridesourcing and its impacts. Does ridesourcing improve urban efficiency? The most straightforward way to answer this question is to compare ridesourcing with its closest competitor – the taxi. Existing researches find that ridesourcing is more economically efficient than taxis, as it offers a better match between demand and supply and substantially lowers the costs of ride searching. However, it is still uncertain if such economic efficiency can be converted into transportation efficiency. While some studies find that ridesourcing brings more cars into city centers and thus worsens congestions, others point to opposite directions. One study commissioned by Uber shows that Uber offers better accessibility in low-income or low-density areas than taxis. In terms of transportation safety, there are different opinions from different perspectives. For instance, some argue that both drivers and passengers feel safer because of the rating and tracking systems of ridesourcing operators. Others pay attention to the lack of driver training and uninsured or underinsured ridesourcing vehicles. In addition to taxi, ridesourcing also poses interesting questions regarding its relationship with public transit. Ridesourcing improves urban efficiency when it complements public transit during late night hours and weekends, when it serves as a feeder for public transit, and when it substitutes certain transit routes in low-density areas with lower costs. On the other hand, it also reduces transportation efficiency when it competes with public transit during rush hours in high-density areas. Does ridesourcing improve urban equity? This question needs to be answered from three different perspectives – consumer (passengers), prosumer (consumers as co-producers), and producers (drivers). Firstly, from the consumers’ perspective, many studies confirm that ridesourcing users tend to be younger, more affluent, and better-educated. As ridesourcing is getting increasingly popular and starts to compete with public transit, it brings out the question of transportation equity – who can enjoy this new form of transportation and who is excluded? Besides willingness and capabilities, the use of ridesourcing apps requires a smartphone and a credit card. Surprisingly, even in developing countries, there are still people who don’t own these two things. For example, in the US, 23% of people don’t have a smartphone in 2016. In 2014, 47% of adults in OECD countries did not have a credit card. There are also concerns about discrimination against passengers and the issue of data privacy and security. Secondly, the term “prosumer” origins from Alvin Toffler’s The Third Wave. In this book, Toffler argues that in modern society more and more companies ask consumers to do the work that used to be done by employees, in which the consumers become prosumers. Most importantly, prosumers do the work for free. In ridesourcing, the rating system turns passengers (consumers) into supervisors (prosumers) who constantly monitor the performance of drivers. There are mixed opinions on whether prosumers are exploited or empowered. In business and marketing studies, prosumption is considered to provide an equal relationship between consumers and producers, and prosumers enjoy the co-creation and co-producing activities. Critical studies, on the other hand, argue that the true meaning of co-creation is exploiting the valuable creativity and labor time of consumers. Lastly, from the producers’ perspective, we look at the ridesourcing drivers. Different from regular employment, ridesourcing drivers are called “on-demand workers,” as they don’t have regular working hours, stable salary, or any benefits associated with employment status. There are again mixed opinions on on-demand work. Advocates view on-demand workers as micro-entrepreneurs, who enjoy flexible working hours and good life-work balance. In contrast, critics contend that on-demand workers receive poor compensation and minimal job security. Even though there seems to be a tradeoff between flexibility and security, some argue that flexibility and employment status are not incompatible. More efforts are needed to improve the working conditions of this ever-enlarging group of workers. Does ridesourcing improve urban sustainability? Even though the sharing economy has always been positively associated with the idea of environmental sustainability, there is in fact very little empirical evidence to support this association. Ridesourcing has two potential ways to improve urban sustainability. First, ridesourcing might reduce private car ownership via altering people’s travel preference. However, this possibility has been denied by existing studies, which find that most ridesourcing users did not make any changes to car ownership. Second, ridesourcing might be more energy-efficient and generate less greenhouse gas emission compared with other transportation modes. There is evidence showing that ride-sharing and traditional carpooling is indeed more energy efficient than driving or taxi. In terms of ridesourcing, however, no consensus has been made on whether it is more energy efficient than taxicabs, and there is also a lack of research measuring the exact level of emissions generated by ridesourcing and taxi. In addition to taxi, ridesourcing might also replace other modes of transportation, such as public transit, biking, and walking. Measuring the environmental impact of ridesourcing must take into consideration all types of transportation mode changes. Lastly, ridesourcing might generate additional travel demands. As shown by a few studies, around 8-12% of ridesourcing users say that they will not make the trip if ridesourcing is not available. Scarlett T. Jin is currently a PhD student at the Department of Geography, The Ohio State University. Scarlett does research in shrinking industrial cities in China, sharing economy, and the application of big data in urban studies. Previous Post« Previous Can Trigger Warnings Help People Regulate Their Emotions?